Our Monel 400 Buttweld Fittings is resistant to caustic solvents, acids and alkaline, as well as seawater, has high robustness at high temperatures, and are wieldable too, used in many marine engineering applications. 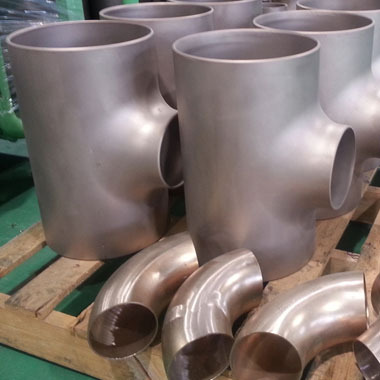 We are a manufacturer and exporter of a comprehensive range of Monel Alloy 400 Pipe Fittings, which are made of a Copper-Nickel alloy which is malleable yet durable, are serviceable under a wide range of temperatures and resistant to some corrosive elements. We also provide a wider range of other Monel buttweld fittings such as; Monel 400 Welded Buttweld Fittings, Monel 400 Elbow, Monel 400 Pipe Reducer, Monel 400 End Cap, Monel 400 Cross, Monel 400 Pipe Bend. Give us a call today. We also offer quality tested, certified Monel 400 Seamless Buttweld Fittings in nominal diameters and pressure ratings, which are reliable and join pipes conveying pipes conveying water and gas in the beverage and fire suppression industry. Aspirinox Inc is a certified company that offers excellent Alloy 400 Pipe Fittings products which all are quality assured and innovative as well. At Aspirinox Alloys Inc, we give preference to the quality and standards into the goods, as well as services that we offer. Above all, we focus on complete customer satisfaction. Contact us today to request a free quote! Specifications for Monel 400 Buttweld Fittings. If any specification is not mentioned here, please use the contact button for quick quote. Request the latest Monel 400 Buttweld Fittings List. Please click on the request a quote button or click here to request the updated price list and ready stock information along with your requirement. Aspirinox Alloys INC maintains a stock of all standard items and can export them at best price for Monel 400 Buttweld Fittings.